We recently launched an experience to a select group of QuickBooks® Online customers that provides a free upgrade period for QuickBooks Online Advanced. Today, we want to share more about this experience and what it means for you and your clients. Select QuickBooks Online customers have been provided a risk-free, no-obligation, opportunity to try QuickBooks Online Advanced. This is completely free of charge, and customers are able to try select Advanced features without needing to worry about any “lock-in;” in other words, customers don’t need to worry about losing any information during or after the free upgrade period, and trying the features out during the free upgrade period does not obligate them to pay for QuickBooks Online Advanced going forward. 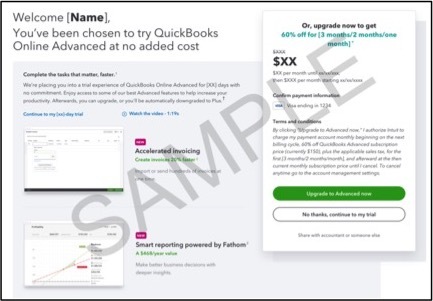 Once the free upgrade period expires, users in the QuickBooks Online Advanced free upgrade experience will automatically go back to their previous version of QuickBooks Online, unless they specifically choose to upgrade to Advanced. If a stopper appears, continue through the rest of the steps. If you don’t see a stopper, proceed to step 7. See full guide on how to downgrade here. Alternately, if you and your clients really like QuickBooks Online Advanced, they have the ability to upgrade to Advanced with a discount. Please note that if your client actively chooses to upgrade, only at that point will you see a change to your client’s monthly payment amount. Today, only selected QuickBooks Online Plus customers who are currently paying list price and paying for their QuickBooks Online subscription costs themselves will be getting this free upgrade period. Wholesale billing customers are not included in the Advanced free upgrade experience. How do usage limits affect this free upgrade period? Businesses are capped at five users while in the free upgrade period and will not be able to add more users than this. This allows us to seamlessly revert customers to their QuickBooks Online Plus plans at the end of the free upgrade period, with no action on the customer’s part. Customers can add to their classes, locations, and chart of accounts even if they are over limits while in the Advanced free upgrade period. When a customer is automatically reverted to their QuickBooks Online Plus plan at the end of the free upgrade period, they will keep any classes, locations or accounts they added. This will be the case even if the customer is over the usage limit: Yes, this means that effectively a customer could grow their chart of accounts, classes and locations counts without needing to fully upgrade to QuickBooks Online Advanced. However, after the customer returns to QuickBooks Online Plus, the customer will not be able to add additional classes, locations, or accounts until they have reduced the number below the usage limits. At that point, usage limit rules will apply and read this article to learn more about those rules in detail. As always, we value the role you play in helping your customers be more successful, and we hope this article answers any questions you had about the QuickBooks Online Advanced free upgrades that are rolling out in April 2019. We highly value your feedback and want to hear from you. Please use this form to ask follow-up questions or provide us with any additional feedback. Nima Patel is a product marketer for QuickBooks Online Advanced.